This coming Saturday evening at the 4:30 p.m. Mass we will honor Father James Morris for his seven years of service to St. Roberts and Father Mark for his two years of service. I hope you will be able to join me in thanking God for these two good priests. There will be a reception following the Mass in Hennessy Hall. 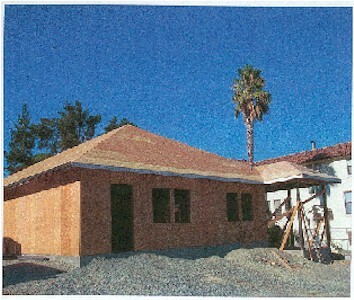 The Parish Educational Center is progressing rapidly. The tile roof is about to be installed and the electrical, mechanical and plumbing part of the construction is almost complete. If you are new to the Parish or have not yet made a pledge, please consider helping in this worthy project. Phone me at the Parish Office - 589-2800. Gradually, I am trying to hand over a good portion of Parish administration to Deacon Rusty Duffey. It is time for me to step back and spend more time in priestly ministry. As you know, Rusty came on board full time in September. During the months ahead, he will be learning how to handle the everyday administration of the Parish plant and will develop new Parish programs. I know that you will be as cooperative with him as you have with me. During this month of October, we pray that we might come to a greater appreciation of the life that God has given to every person from conception until natural death. At this time when the threat of war faces our world, we should pray that all leaders of nations value the life of their citizens and do everything within their power to avoid war. From Oct. 20th - Nov. 17th, we will hear Sunday readings from St. Pauls First Letter to the Thessalonians. Join seminarian Sean Rogers for an orientation to 1 Thessalonians, the earliest written book of the New Testament (only about 20 years after Jesus death !) This is not an in-depth Bible study, but rather a brief introduction to the book. Learn the context from which these fascinating early readings come! Share your talent in St. Roberts music ministry. Rehearsals for Christmas are already underway!! As a Parish Community, We Pray...That those who are answering Gods call to begin their journey to Him through our RCIA program will experience the warmth and love of our parish family. We pray for the ill: Sharon Aiello, Marilyn Arancibia, Robert Bacci, Bastiaan Blumenthal, Marcia Bourne, Ann Burns, Arthur Candia, Josie Clarke, Nan Connolly, Zenaida Cortez, Ana Cosgaya, Imelda Daly, Walton & June Dickhoff, Sandra & William Dill, Carl Edwards, Adela Florez, Henry Fosson, Fred Gaedeke, Jesse Grube, Gladys Haff, Denise Hawald, Joanne Johnson, Koret Koelman, Muriel Krause, Abelardo Landin, Josephine Lavoie, Greg Lille, Marky, Daniel McHale, Rosemary McHale, Jeanne McHugh, Terry McLeod, Josefina Mercado, Sal Milizio, Catherine Murtagh, Thomas OBrien, Louis Ricardo, Doris Ross, Pauline Speranza, William Wegman & Don Vickery . "Heal the Sick!" Jesus has charged His Church to take care of those who are ill by accompanying them with Her prayer of intercession in His Holy Name. The Anointing of the Sick is for anyone who begins to be in danger of death from sickness or the aging process. 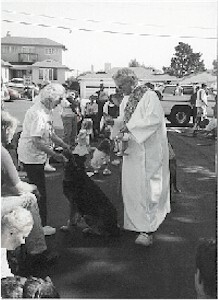 Graces derived from the sacrament are: strength, peace and courage to overcome the difficulties of serious illness or the frailty of advanced years; a closer union with the Passion of Christ; sanctification of the People of God; often the restoration of health; and preparation of our final journey to eternal life. St. Roberts Anointing Mass will take place at 11:30 am, Sunday, October 20th. All who are ill or experiencing the affects of aging are invited to receive this Sacrament. Please call the Parish Office 589-2800 if you or a friend are going to be hospitalized, Father Ring, Father Hamilton and Sister Ita would like to visit. "We have to a great extent rationalized abortion, infanticide, euthanasia, the death penalty and assisted suicide. We have worked hard on the vocabulary of rationalization, calling abortion the termination of pregnancy; infancide, the only humane choice; euthanasia, mercy killing; assisted suicide, creative deliverance. But deep within us we know that each of these euphenisms conceal a rationalization. Deep in our hearts we know that life is Gods pecious gift to us." (Father John Powell, S.J.) During the month of October, our Parish community is asked to proclaim the sacredness of human life from conception till natural death, by our words and by our actions. The Archdiocesan Respect Life Program invites the Catholic Community to a Conference, "Celebrating Life" Saturday, October 19th, St. Marys Cathedral at 9 am until 4 pm. The Conference will address some timely life issues. Keynote speaker, Father Robert J. Spitzer, S.J., President of Gonzaga University and author, will address the "Case for Life". Other issues presented will include legislative trends, understanding stem cell research, and providing service for pastoral healing and reconciliation supports following abortion. Conference fee is $15.00. Please register by October 19th. To register and for further information and/or a copy of the brochure, please call 415-614-5572. At Baptism, each of us was called - called to be a missionary; called to share our faith, yes, even to the very ends of the earth. Next Sunday, World Mission Sunday, provides us a unique opportunity to fulfill that responsibility. Together with Catholics around the world - Catholics in the Missions as well - we will gather, at the Eucharist around the table of the Lord, and offer our prayers and our generous help so that the "Good News" of Jesus Christ may be proclaimed, in word and deed, to the poor and the suffering in every corner of the globe. The help offered next Sunday through the Propagation of the Faith will provide the pastoral and evangelizing work of more than 1,100 dioceses throughout Asia, Africa, Latin America and the Pacific Islands. Please be as generous as possible to the collection for the Propagation of the Faith. May God bless you! EScrip...If you havent signed up yet, please do so. Our group number is 137045398. Check it out on line - escrip.com. Our next get-together will be on Sunday, October 20th, at the Sixteen Mile House. It will be an early evening dinner at 5 p.m. The address is 448 Broadway, Millbrae. Call Bunny Moniz for more information. Our next dinner meeting will be on Monday, October 21st, at 6:30 pm. For reservations, please call Josette Reid. The price is $10 per person. 6th Annual Conference for singles and couples in their 20s and 30s. Topic is, God: A Really BIG Issue, Where is God in the Story of Our Lives?, Sat., Oct. 19th at USF in the McLaren Center ( 8:00 a.m. to 11:00 p.m.). Fee includes keynote by Sr. Christine Wilcox, OP, exhibits, three workshops, Mass with Bishop John C. Wester at St. Ignatius, dinner and dance. To receive registration material: contact (415) 614-5594 or jansenm@sfarchdiocese.org. Dont miss this great opportunity to celebrate with other young adults! Our St. Vincent de Paul Society is in need of peanut butter & jelly, canned stew, "CANNED FRUIT", canned ham, tuna fish, canned pasta, coffee & hot chocolate. Please bring items to the Rectory. Catholic Worker House in San Bruno is in need of new mens socks, cold medicine, canned soup, pancake syrup, laundry volunteers ( once a week or once a month-call 827-0706). Please bring items to the Rectory.